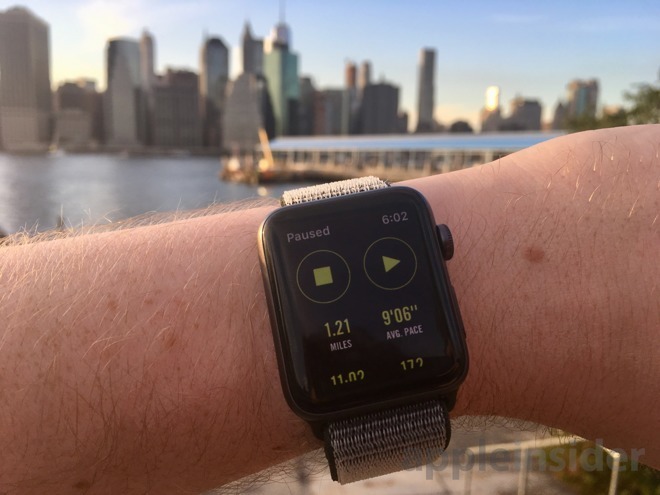 New Apple Watch battery test data published to Apple's website after the release of watchOS 4.1 on Tuesday gives more insight into how streaming music over LTE, a capability enabled by the latest software, affects battery life. Specifically, Apple advertises that athletes engaging in an outdoor workout while streaming audio over LTE and using GPS can expect up to 3 hours of usage before the battery will run out. An extra hour can be eked out of the Series 3 if users load music directly onto the watch and don't stream it over LTE. And disabling LTE entirely —which would disable notifications, alerts and Siri support — helps push the battery life with just GPS, heart rate and onboard audio to 5 hours. Considering that the average marathon finishing time for men in the U.S. is 4 hours and 20 minutes, while the median time for women is 4 hours and 45 minutes, marathon runners may find other, more fitness-specific wearables are better suited for such extended workouts. Or they could just bring their iPhone in tow. Even half-marathon runners will probably want to at least bring their iPhone along with their Apple Watch. Consider that the average running time for both men and women is over 2 hours, cutting it close to the advertised 3-hour limit. The time limit will also be a problem for triathletes, as triathlon finish times are also usually longer than 4 hours. Of course, runners have already brought phones with them on extended workouts for years. And those who want to have a watch-only tracked workout could do so without music, or alerts, if battery life is a concern. And if you're a really, really serious marathon runner, streaming music isn't even a consideration: U.S. Track & Field rules specifically ban the use of headphones by runners competing in championships for awards, medals or prize money. 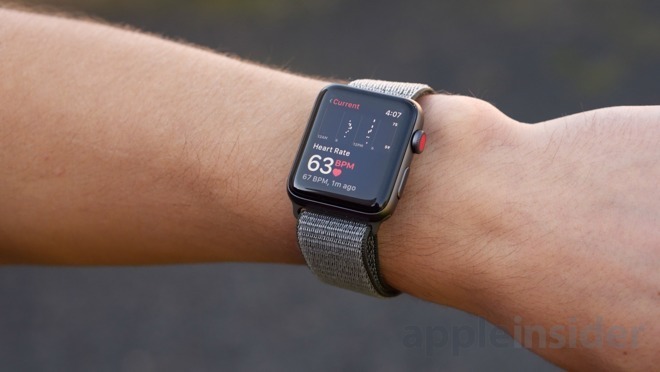 Still, as Apple positions the Apple Watch Series 3 as a connected, fitness-focused wearable, knowing its limitations for serious athletes will affect potential use cases. The one-two punch of LTE and GPS prove to be a serious drain on the Apple Watch's battery. Eliminating GPS for an indoor workout, with just onboard music and pulse tracking, boosts the uptime to 10 hours. Similarly, streaming a playlist over LTE without GPS or fitness tracking offers 7 hours of uptime. That time is reduced to just 5 hours if the user listens to live radio. Apple did not indicate whether using live radio instead of a playlist with GPS and LTE resulted in even less than 3 hours of use. If a user plays music from Apple Watch storage without streaming or using GPS, the rated battery life is 10 hours. Apple's streaming tests used the Apple Music service over LTE, and also accessed live Beats 1 broadcasts. The tests were conducted in October ahead of the release of watchOS 4.1. Overall, the Apple Watch is rated with up to 18 hours of uptime for the average user by Apple, though actual user accounts vary wildly. 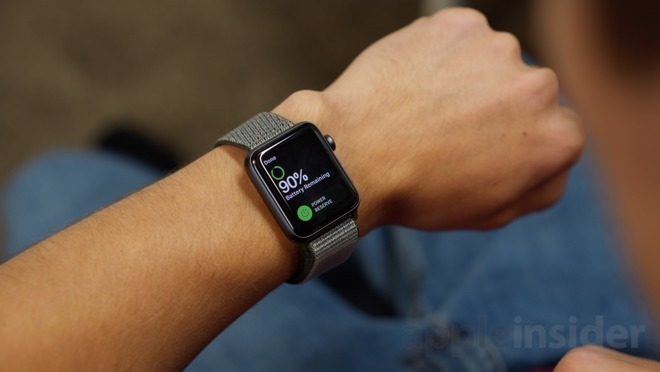 Some who do not exercise with the Apple Watch and restrict it to limited use can get multiple days out of the device before needing to charge.